Dogs are pack animals by nature. When they live in your home instead of the wild, you’re the pack, and they want to be with you. Most dogs adjust to your family’s schedule of coming and going, but one out of every six dogs displays symptoms of separation anxiety. Watch your step! 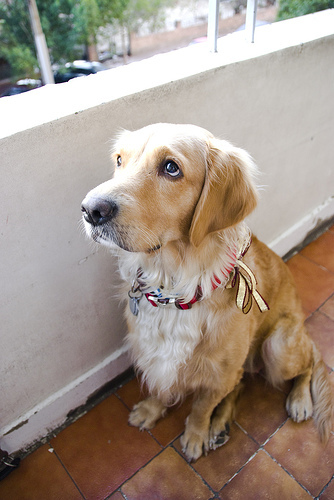 A common reaction of a pet being left alone is urination or defecation inside the house. Disturbing the peace. Howling, whining and barking are all ways your dog can let everyone know that she’s unhappy to be left alone. Making it personal. Your dog may destroy something that you like. It could be your child’s toy or your shoes. Picky eating. A stressed pet may have little or no interest in eating. Escape artist. Many pets make escape attempts, and the less than successful attempts often lead to destruction near windows or doors. Or Is He Just Bored? Anxious behavior usually happens a short while after you leave. But a pet that’s bored may do the same thing – destroying something or getting into trouble while you’re away. If there’s doubt about the cause of your pet’s behavior, you might want to set up a video camera to capture the real story. If you decide that Mr. Cling really is suffering from separation anxiety, there are things you can do. We’ll talk about those in our next blog post.